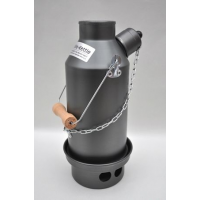 Ghillie Kettle Base Camping Propane Stoves Adventurer Kettle - Hard Anodized ghi0002. Holds up to 1.42 L / 48 fl oz. Ghillie Kettle Base Camping Propane Stoves Explorer Kettle - Hard Anodized ghi0001. Holds up to 1.0 L / 33.8 fl oz. Ghillie Kettle Base Camping Propane Stoves Maverick Kettle - Hard Anodized ghi0003. Holds up to 0.5 L / 16.9 fl oz.